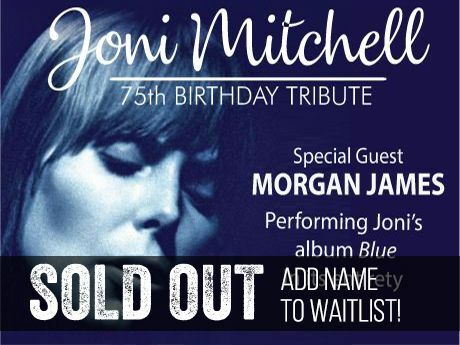 While some New York-based Joni Mitchell fans may be regretting not flying out to Los Angeles to attend one of the mega-concerts celebrating her birthday this week, we did get a nice helping of beautifully-sung Joni music on November 4th at City Winery. The two Sunday shows, afternoon and evening, were produced by and were a benefit for Theatre Within, a non-profit that gives free workshops in art, songwriting and meditation to cancer survivors and their families. I attended the evening show. The main attraction was Broadway performer Morgan James singing Mitchell’s album Blue in its entirety. James released a cover version of the 1971 masterpiece in 2016, and her performances of the songs were thrilling from beginning to end. She has a strong flexible voice throughout her range, but I particularly loved her floating, almost completely vibratoless high notes, deployed to heartbreaking effect especially in the songs “California”, “River” (particularly exquisite) and “Blue” which was devastating. The theatricality that a Broadway and cabaret artist brings to this material was on display, sometimes distractingly, but more often enhancing her interpretations. She has a way of slightly swallowing her vowels in her lower range, slightly reminiscent of Cher, that I initially found offputting and a little mannered in “All I Want” and a few other songs. But her stage brain really served her (and us) well in songs such as “The Last Time I Saw Richard”, that brilliant little monologue. The drama of that song has never sounded more truthful. The evening was put together by Joe Raiola, Artistic Director and President of Theatre Within and clearly a huge Joni fan. To open the show he read a number of blunt opinions from Joni and later, adoring quotes from David Crosby, Steven Stills and Graham Nash, to much laughter. One reason the evening worked so well was the wide variety of approaches to the music. The first performer was Maura Kennedy, who with her husband Pete is in the folk-country duo the Kennedys. She amusingly admitted that, though this was a solo billing for her, the guitarist on her left was indeed, Pete Kennedy. They opened with a fine performance of “Cactus Tree” and an even better performance of “Raised on Robbery”, slowed down from Joni’s version to be more languid, more country (the couple toured with Nancy Griffith for many years) and more satisfying for me than the original. Pete Kennedy tuned a string down, during the song, low enough to add a convincing bass accompaniment. After a lovely version of “Urge for Going”, introduced as the perfect song to play on the day Daylight Savings Time ends, and demonstrating some Sandy Denny-esque folk vocalization, Maura pulled out the obscurity of the evening, “Hunter (the Good Samaritan)”, never released (though the song almost made it onto Blue), prefacing it with a gentle suggestion that this country might consider treating emigrants more kindly than it currently is. Well received by the sympathetic room. The next performer was Anastasia René, a phenomenal jazz singer whose opener, “Blue Motel Room” was a huge highlight of the evening. Perfectly synched with musicians Dan Loomis, upright bass, and Chris Bergson, guitar, she kept the song high and light and delicious. Her “Woodstock”, in a 6/8 shuffle rhythm and digging more into her lower voice, was almost as good. Mary Fahl, a blonde angel with a gorgeously rich voice somewhat reminiscent of Julia Fordham, performed next, and two of her songs, “Women of Heart and Mind” and “Cold Blue Steel and Sweet Fire” particularly suited her dark, full sound. She struggled a little with both her guitar-playing and mic technique, but charmed with her obvious love for the music and the artist, and that huge complex voice. She told of hearing Joni’s orchestral version of “Both Sides Now” and weeping in a hardware store, before singing the song. After a short break, music resumed with Leslie Mendelson, a fine singer, guitarist and pianist. Opening with “You Turn Me On, I’m a Radio” with a light sure vocal, she was the first musician to go to the piano, singing “Free Man in Paris”, and suggested that she would’ve sung “People’s Parties” at the piano as well. Instead she played guitar and sang it beautifully. Then came Morgan James singing the album “Blue” all the way through, definitely worth waiting for. Almost all the musicians came back onstage for “The Circle Game”, the encore, and we all sang along, of course. Theatre Within is a grassroots non-profit committed to having a positive social impact by providing free, ongoing workshops in creative expression and mindfulness to underserved communities. This article has been viewed 1,491 times since being added on November 12, 2018.